"Three Harleys" is an excellent read. 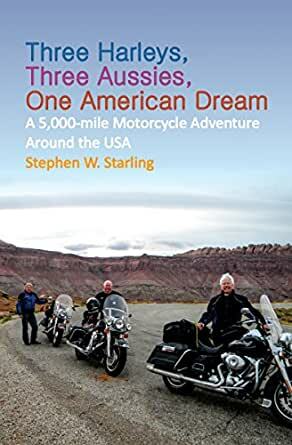 It combines a vivid travelogue -- an engaging account of a kind of dream motorcycle trip with three friends through some iconic regions of the western USA -- with really excellent local information and history. The maps included with each chapter are informative and easy to follow. The narrator's authentic voice brings it all to life. This book is the next best thing to riding pillion with him. 5.0 out of 5 starsStunning travelogue. Best I've read about touring western states. Great book. Good writer. Very well written. Really engaging. Want to do a similar trip myself now (minus the sleet or snow though). Inspired to go from LA to SD as well as SF next chance I get now. 5,000 miles in a month is 250 miles a day come whatever the weather is dong. I'm keen on maybe half of this trip - say going from SF to LA to SD then the southern states across to Orlando. Read a good book for a similar journey that said to go for Motel 6 instead of KOA campgrounds as it'd work out cheaper and easier. I'll need to get a few weeks off work and my wife's ok first though. Keen on any how to books that help you get the ok.
5.0 out of 5 starsA MUST READ FOR ALL MOTORCYCLISTS AND ARMCHAIR RIDERS ALIKE!!! I have pretty much read most of the books out there regarding motorcycle adventures in the United States but this book stands out. The author has a wonderful grasp of the English language using his vast vocabulary to describe his surroundings as he and two pals ride 5,000 miles around the West Coast of America. Having been to all the places in the book it was extremely enjoyable to relive those rides through Starling's brilliant descriptive prose. Neither pretentious or overly simplistic the book will transport you on a fabulous ride around America.......so sit back, sip a favorite adult beverage and enjoy the ride! 4.0 out of 5 starsEpic account of a grueling motorcycle tour of the western U.S. I picked this as a winter read during the off season for riding motorcycles. I was not disappointed. The author's skill with the written word left me exhilarated, as if I had been there on the road with him. His sense of humor is wry, and tempered with the wisdom of a man who has seen his share of life and enjoys the world around him. I recommend this book to anyone curious about touring the American West, whether by motorcycle or by more conventional means. 5.0 out of 5 starsMust read for armchair travellers and adventurers alike. Three Harley's, Three Aussies, One American Dream took me back to my youth, (50+ years ago) feeling the freedom, excitement and a little craziness of riding pillion with a fearless ( or so it seemed) Harley enthusiast. From the opening paragraph I felt the fluttering in the chest and tightening in the body when weaving through the Los Angeles traffic. He had me hooked. From that moment, Stephen wrote his story with the rare quality of taking his reader with him. I could feel the meltingly hot sun of the desert, breathing in the dust and longing for a break from the heat, to the numbingly, freezing mountain ranges with their treacherous roads, my heart in my mouth every step of the way. But this isn't just about a boys book of adventure, for those who have been inspired to take a trip of their own, don't miss the opportunity to take advantage of Stephens planning strategies, safety measures and to expect the unexpected which inevitably happens. Stephen has also researched the historical origins of his American adventure which makes fascinating reading. Whether you are young and looking for adventure, or like me ( a 68year old lady). I highly recommend going on this journey with Stephen. A fairly good travel log of places that went to. But a little to flowerie for me. I have ridden many of the places in the Desert Southwest and All of highway. But a fun reading!